Early morning 5 a.m. our train reached Chennai. This was my first ever visit to Chennai and Tamilnadu. We took a prepaid auto to a hotel in Nungabakkam. While moving to the hotel we noticed that Chennai had been heavily raining all these days and the roads and areas of the city were almost flooded. On reaching the hotel, we checked in and took an hour of rest and then got ready. Next morning, Sivadas bhai picked us up along with Kartikeyanji and his friend to help navigate and visit some Jeeva Samadhis in Chennai city. The first place we went to was the Jeeva Samadhi of Siddha Nadhamuni Swamigal near Pachaiappa College. The temple is named after Him as Nadhamuneeswarar Alayam. On entering the place, it was quiet and we saw the Shiva temple with a Shivalinga. On the left of the temple was the Jeeva Samadhi. Not wasting any time, we quickly sat down in front of this and began our meditation. During meditation two little cute kittens crawled into my lap and were playing. The lady who looked after the temple was looking at all of us for a while. Then she asked where we came from. When we replied, she asked, "So have you come finding this place on the internet?" We happily confided. This indicated that there WERE people who were digging out info from the net and reaching Jeeva Samadhis. We then left to the next location. The next Samadhi we approached was of Siddha Gangadhara Swamigal on Harrington Road. The temple associated with the Samadhi is Vinayakar Temple. As we finished meditating, a strange thing happened. One of a sadhak friend called and to keep sanctity of this place i did not receive the call, but when the call came again i guessed it could be something important. When i took the call he told me that he was having a terrible headache for the past few days and this came and went after he returned from Kanhangad trip recently. But in a minute he said that the pain was reduced suddenly while speaking. i informed him that it was because we were at a Jeeva Samadhi and asked him to connect to this Samadhi, not necessarily needing to know who it was, but just to connect for a few minutes. After a few minutes, i ended the call and we proceeded to the next Samadhi. By the time we were finished visiting the next Samadhi, i received SMS from the same sadhak friend stating that his headache was completely gone and thus thanking Baba and the Holy Siddhas for it. Such is the power of connecting to any Siddha from any location. One can even connect to them through pictures or videos and have mystical experience almost instantaneously depending on the quality of bhaav, trust and love used in connecting with Them. We then went to the next Samadhi that was pretty close on the same Royalpettah High Road. Since it was already past 1 p.m. we only hoped it was not closed and when we reached we saw that it was not! This was the Jeeva Samadhi of Siddha Appar Swamigal, written there as "Brahmna Samadhi". The next two samadhis were Thiruvanmiyur. In Thiruvanmiyur is a place Mayurapuram. Here, the samadhi was located inside a huge space containing temples and free food offering spaces for the poor. The whole area i must say, probably even a kilometer radius radiated a strange peace that we could sense long before we even reached this divine place. This was the Jeeva Samadhi of Siddha Pamban Swamigal. We spent a good amount of time here. There were devotees singing the poems and songs written by Pamban Swamigal. 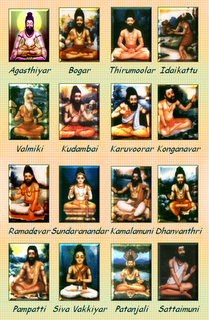 Swamigal was a great devotee of Lord Murugan. Sivadas bhai informed that every full moon night powerful worship is done here and meditation is powerful on this day. The Siddha is said to have done many miracles during his physical life in this area and there was a wide number of followers who came there regularly and offered their love in their own way, many were found to be sitting in meditative silence. Amidst all the devotees laid a dog in the center of the hall deep in peaceful slumber that was noticeable on it's face. In front of the samadhi was the Lord Murugan temple. Picture is below. The next samadhi was just behind this samadhi and it was none other that the Jeeva Samadhi of the disciple of Pamban Swamigal known as Siddha Subramanya Dasar. Gratitude to my Guru and all Holy Siddhas.